Any way your serve them, crab cakes made from fresh blue claws are especially sweet. If you can’t catch your own, lump crab meat will suffice. If you prefer, substitute tarter sauce or cocktail sauce for the pepper jelly. Photo by Tom Schlichter. If you are lucky enough to have a secret crabbing spot, you can easily catch enough fresh and tasty blue claws to make this recipe from mid-summer through mid-fall. If you can’t get them on your own, lump crab meat will be fine. Blue claw crab, by the way, freezes well as long as you keep it in a sealed container. You can freeze the crabs whole after removing the top shell and lower section and rinsing out the tomalley, or pick all the meat free and freeze it separately. Claws can be frozen as well. Do not store crabs or claws with shells in freezer bags as the shells will eventually puncture the plastic and spread their scent throughout the freezer. Stored shells and legs also make a good starter for a seafood or crab stock or chowder. Prep Time: 10 to 15 minutes if using lump crab meat, longer if you need to clean fresh crabs. Mix together all ingredients through the cayenne pepper. In a separate bowl, combine eggs, mayonnaise and mustard. Add to crab mixture, don’t over mix. Add juice of half a lemon. 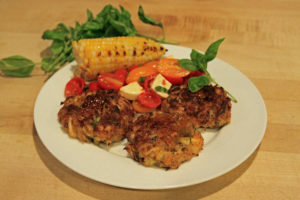 Form mixture into crab cakes roughly 2.5-inch diameter and ½ inch tall. Spray the top of each crab cake with olive oil or canola spray. Place sheet on bottom rack oven and cook at 450 degrees for 20 minutes, until lightly browned. Move to top rack and broil for 1 minute until golden brown before removing from oven. Remove from oven. While still hot top each crab cake with a small amount of pepper jelly to your liking. Allow the pepper jelly to melt.